UPDATE March 12, 2013: Google has released an update to Chrome for iOS to fix the startup crash through the App Store. users, but I think I found a fix for the issue, which seems to revolve around the syncing protocol, specifically Google anonymous data collection. In order to do this though, you must be quick. 1: Uninstall Chrome for iOS by holding down the icon on the home screen until the icon start to jiggle. Then click on the little x in the top left corner of the app. 2: Reinstall the app from Apple’s App Store. 3: Open the app and hit check “Send Anonymous Usage Data”. Many users in the comments are saying that they had to accept Google’s “Anonymous Usage Data” option on the Terms of Service page in order to get this to work. I did not have to do this on my end, but so far it seems I am the exception. Click “Accept and Continue” when the Terms of Service pop up. 4. When the Google sign-in screen pops up, hit skip. This is how I got the app to work for me. I had tried just the reinstall, but that still crashed the app for me. It was only when I skipped the login screen that I could once again use Chrome for iOS. I can also confirm that I was afterwards able to re-login to my Google Account and begin syncing Chrome again as normal. It is interesting to note the the majority of those of people having this problem, though certainly not all, are users using a jailbroken device. Whether or not this is an issue with the jailbreak, with Chrome, or with both has yet to be seen. It has also been verified that Cydia apps/tweaks like BrowserChooser seem to be having no effect in either causing or eliminating the crashes. Let me know if this worked for you or if you have any other methods that worked. And please share this so we can help others. Hopefully this issue will be resolved soon. One of the great things about the Internet is the ability to get work done and communicate with each other faster and over greater differences than ever before. If you’re working with a team on a project, whether it be developing your own app, a new business plan, or a school project, you may need an app for those times when you can’t meet your teammates face to face. Kickoff wants to help your team get work done. After you make a free account with Kickoff, you sign into the app and start making teams. You create different teams for different project. For example, I’m working on a podcast with Reagan on one team, while I have another team for learning to code something, etc. Then the team maker can invite other users to their team. 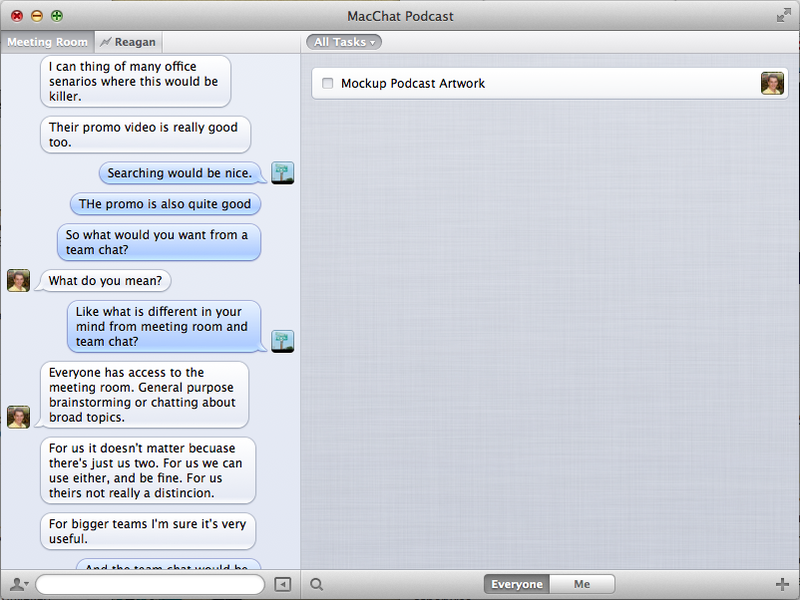 Kickoff looks like a modified version of the Messages app introduced with OS 10.8 Mountain Lion. This is actually a good thing as it’s very clean and straightforward. On the left is a sidebar that serves as your chat window, with the default chat open being the Meeting Room; this is where you talk to all of your team. You’ll notice just above the chat window is a tabbed section where you can choose to chat with individual team members. This is especially useful when you need to talk about something private with them, but also so you don’t bother your other teammates with unnecessary chatter. You can also tag someone in the Meeting Room chat, so that when you use their name, the chat bubble turns yellow for them to see (and only them). You cannot delete messages in a chat though. On the right hand side is the tasks and lists view. Tasks are assigned to a list made by the team for things that need to be accomplished. A task maker can assign these tasks as general or to individuals in each list. Each user then has the option of viewing all task the team needs to complete, or limiting it only their tasks than need to be complete. Once a task is done, the team member(s) can check it off the list and the task fades away. The nice thing about this setup is that you’ll only see the tasks for that team and not the other teams. It would be cool to have an integrated view of tasks, where you could see all of your own open tasks at once sorted by team. You can, however, drag lists up to the favorites bar next to the “All Tasks” button, so that you have quick access to the ones that are most important to you for that team. Scheduled tasks are also not available in Kickoff, meaning you can’t assign a teammate a task and a specific due date all within the app. Kickoff only communicates via chat, though you can drag and drop pictures, videos, documents, and links into the chat window for all to see and access. Other collaboration tools, such as Citrix Go-To Meeting have video and audio chat built in, as well as screen sharing built in, and Skype has the features of Kickoff built in except for the task manager and assignment features. I think if the developers can add these features in the future, Kickoff really stand out even more as a collaboration tool. But that doesn’t mean it doesn’t do an excellent job as it stands now. Kickoff isn’t trying to be a Skype competitor and be solely a communication tool, rather it wants to be a tool for teams to quickly and effectively communicate with each other and get things done. Currently, the app is free for the Mac while in beta (OS 10.6 and higher), but the developers say it will be a one time pay app and released in the Mac App Store once it is complete. An iOS client is also in the works, but as of this writing it has not been released. We will hopefully give another review of this app when it has been released as a final version, and its iOS companion app. You can download the free beta in the meantime from http://kickoffapp.com/. If you have any questions, comments, or suggestions about this or any other topic, leave a comment below or email us at easyosx@live.com. You can check out more on Facebook, Twitter, and YouTube by hitting the buttons on the top of your screen. And check out our Google Plus. Thanks! About a year ago, OS X Lion was released for the Mac. It brought many great features to Lion, some from iOS and some brand new. However, it changed up a number of things that annoyed some users. An app called Lion Tweaks, which I reviewed for a previous App of the Week post, was released to help users tweak Lion to their liking. With the release of Mountain Lion for the Mac, developer Fredrik Wiker has come back to help us tweak. Mountain Tweaks is a new app that does essentially the same thing as its older brother with a few improvements. 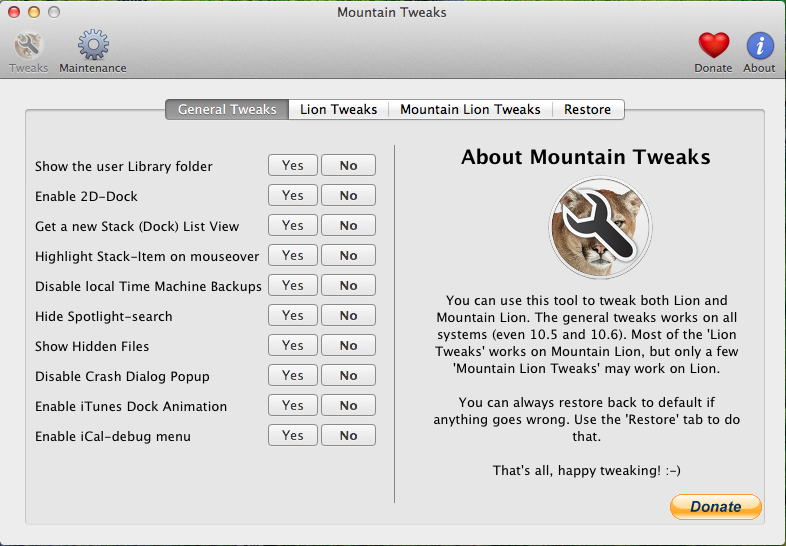 Mountain Tweaks works to be compatible across both Lion and Mountain Lion, making it a one stop shop for Mac users. Mountain Tweaks is organized into 4 tabs: “General”, “Lion Tweaks”, “Mountain Lion Tweaks”, and “Restore”. The settings under each tab are as simple as selecting Yes or No under the setting you wish to alter. The general tab shows several settings that range across multiple versions of OS X. According to the developer, most of these settings can be used on Leopard (10.5) and Snow Leopard (10.6), as well as Lion and Mountain Lion. These include settings like enabling a 2D- dock, disabling local Time Machine backups, hiding Spotlight search, and more. The Lion tab shows items specific to the Lion system such as disabling Auto-Save, enabling Airdrop on old machines, changing the look of Address Book and iCal to aluminum, and more. The Mountain Lion tab similar changes you can make to Mountain Lion, such as disabling Gatekeeper. The Restore tab simply is a giant button that allows you to reset all the things you changed through Mountain Tweaks to their original states. The app states that many of the tweaks available to Lion are also available to Mountain Lion, but only a few work the other way around. The app has a wide selection of tweaks for Lion and for Mac OS X in general, but there aren’t very many for Mountain Lion at all. However, Lion Tweaks didn’t have to many either but now has quite a few tricks up its sleeve. It’s safe to say we can expect the same to come from Mountain Tweaks in future updates. Mountain Tweaks is available for OS 10.5 and later, though it is best run on OS 10.7 and OS 10.8 (Lion and Mountain Lion respectively). While it is a free app, the developer does ask for donations if you like the software, which I did. You can check it at http://tweaksapp.com/app/mountain-tweaks/. If you have any questions, comments, or suggestions about this or any other topic, leave a comment below or email us at easyosx@live.com. You can also check us out on Facebook, Twitter, and YouTube by hitting the buttons on the top of your screen. And be sure to check us out on Google Plus. Thanks!